Look no further if you’re looking for a meaningful volunteer experience in one of the world’s top travel destinations in the world! Volunteer in Nepal Himalayan, and enjoy the land of the world’s most incredible panoramas, snow peaks, Sherpas, peaceful monasteries and mantras, and magnificent culture while uplifting the lives of the beautiful people. How would you like to volunteer in one of the world’s top 10 travel destinations? If you love unspoiled nature, the beauty of snow-capped mountains, and living in a region inhabited by warm and welcoming people, then volunteer in the Nepal Himalayan region. The Himalayan region of Nepal is known for its panorama of world’s highest mountains, the unique culture of local people who live in their shadow and also the rugged beauty of the valleys that lie below the mountains. At the Everest region of Nepal, you’ll be able to enjoy breathtaking views of the Himalayas while experiencing the warm hospitality of the local Sherpa people. For centuries - Sherpas, the local people of the region, have lived a hard life walking up and down high mountain passes for trade with the outside world. They also had to endure the extremely cold weather to grow vegetables in the fields during the short summer months. 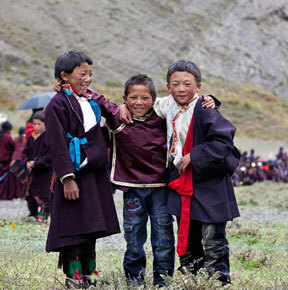 Thanks to the arrival of tourists from around the world, the lives of Sherpas have improved drastically. Now, the region has schools, hospitals and food and warm clothes-even during the harsh winter. However, this region is still comparatively backward, and needs more help from volunteers to progress. Contact us today and find out how you can help the lives of these peaceful people against a backdrop of the legendary Himalayas. In recent years, volunteering has become more of a business than charity. Many organizations in the US, UK, Australia, and New Zealand run volunteering programs solely for profit. But this is not the case with New Hope Volunteers. Our aim is to offer World's Most Affordable volunteer program (without compromising the quality) so that all volunteers, irrespective of their income level, can volunteer to serve humanity and enrich their life. In our program, except our registration fee of $279,which we need to advertise, cover office expense and pay salary, volunteers pay their money directly to the host family and project (or country coordinator). This ensures that 100% of your money goes for you. New Hope Volunteers will arrange for the accommodation and meals throughout the volunteering duration in the Nepal program. In the Himalayan program, you will either stay warm in an on-site accommodation in the project or live with a socially respected Sherpa host family. The Sherpas are known for their legendary hospitality and friendliness, so your stay with the host family is bound to be a home away from home. You will also be able to get an insight into their lives and can participate in their festivals. In the Teaching Monastery Project, you will stay in an onsite accommodation inside the monastery. You will have a room for yourself or might have to share with other volunteer. The resident monk chef will prepare you 3 local meals a day. The meals will be like any traditional Nepalese meals. On breakfast, you will be given tea, sometimes toast, and for lunch and dinner you will have dal, bhat (rice and lentils) with other vegetables. New Hope has a coordinator who is based in Khumbu region. New Hope also offers extensive support for you so that you feel right at home while volunteering. The main person supporting you throughout your program will be our country coordinator in Kathmandu, who is also in-charge of your volunteer program. Whenever possible, the coordinator will call or visit you to see if you are happy and satisfied with your project. You will also have the coordinator's mobile phone number that you may call any time should an issue arise. Our project staff will also guide and help you throughout the program. Where is the Himalayan region? Do I get any orientation in Kathmandu? Once in Lukla what happens? Do I carry my own backpack? What specific things do I need to bring? Will I need a special permit/visa to volunteer there? Are there any ATM machines/banks there? Do I need extra money? Are foods expensive? Can I trek/explore Sherpa villages? How can I communicate with Kathmandu office and my family? What happen if I get sick? Who will support me if I need help? You will also be helped by your host family. Will other volunteers be there? Will we live together? Can I split my volunteer time in Kathmandu and Himalayan region? What about Weather? When can I join the project?